With a LOW initial Franchise fee of $25,000 for a BedBug Chasers is a solid opportunity with potential for growth to be in the Business of How to Get Rid of Bed Bugs. Choosing to own a BedBug Chasers Franchise is a Low Initial Investment Franchise with strong potential for income stability and growth. You can invest with confidence knowing that BedBug Chasers is an industry leader in technology, methodology and environmental conservation in the Business of How to Get Rid of Bed Bugs. A Comprehensive 5-day training program that covers every aspect of operating your own BedBug Chasers and teach you How to Get Rid of Bed Bugs the BedBug Chasers way! A website located within our national website that will give you access to upload your own news, testimonials and photos from your customers. 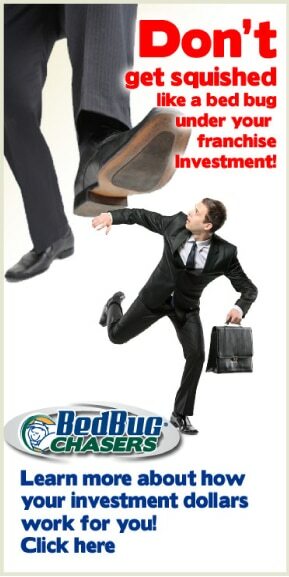 Access to our vendors and nationwide network of equipment rentals to handle any size bed bug infestation. Since no two service areas are exactly the same, we do not require our franchisees to purchase the same equipment configuration as everyone else. We will analyze your area to determine the best and most cost efficient set of equipment for your needs, while ensuring suitability for future growth. Of course, your Low Initial Investment Franchise will vary depending on how much equipment and how large of an operation you wish to start. To see more detailed information ask for our Franchise Disclosure Document!